Trolls — breaking online comments since 1994. Online comments and reader reaction to news are often enlightening. Unless of course they’re disrupted by attention trolls, which they often are. Which is why commenting for the most part is still broken. Even the world’s largest bloggerprenuers know this. Blocking trolls, however, is useless. They just create new accounts to perpetuate the insanity. To really nip them in the bud, you have to ensure that they fail to get a reaction. Here’s how I would do it: Keep comments open, allowing anyone to register and make a remark. Flag the ones (either individually or by email/account) that are off-topic, rude, or spam. But instead of removing these comments, keep them visible to the IP address from which the comment was made, while hiding it from all other readers. Basically making it visible to only the troll. In other words, the best way to discourage trolls is to ignore them. 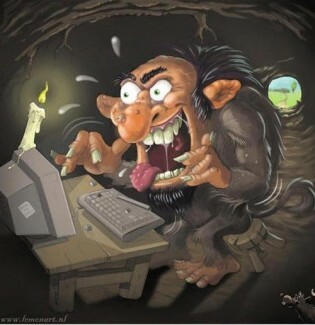 Of course, a small minority of technical trolls might wise up and try logging in on different accounts from different IP addresses. But I think this could do wonders to fixing the problem. The web made us smarter. Is Facebook making us dumber? NBC/KSL—Like AOL before it, Facebook is the latest in a long line of mainstream technologies to introduce a lot of new users to the power, utility, and network effect of the Internet. At the same time, the popular hangout has negatively impacted the number of public comments taking place online. Case in point: The number of people making online remarks has dwindled from a record 15% five years ago to an estimated 7% last year, according to market research by Nielson.